PORTSMOUTH originally owned by William Williams, who built a log cabin here in the 1860s. Originally known as "Cologone Settlement" and in 1886 it moved into Portsmouth and was platted on August 17, 1882, by the Milwaukee Land Company. The village was incorporated in 1883, with A. W. Sims as the first mayor. A post office was established in 1882 with George Walters as first postmaster. 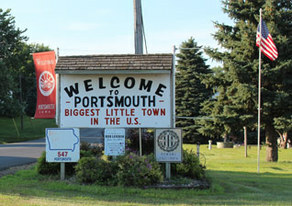 Portsmouth is home to a variety of businesses. The largest is Leinen, Inc. a fertilizer and farm chemical company. 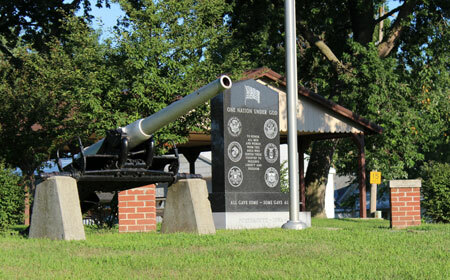 Others include Shelby County State Bank branch office, G & R Feed & Grain, and Club 191 – a well-known restaurant and supper club. St. Mary’s Catholic Church – on the tour of the German Villages. Originally built in 1890 of locally made bricks, it was destroyed by a tornado in 1940. The new church was constructed in Romanesque style in 1951 and included the Our Lady of Fatima Shrine. Construction materials include Ozark stone, Tennessee flagstone, and Carrara marble statues imported from Italy. Held annually in June to celebrate the Church and Community.